It’s officially autumn (yes! ), and that got us wondering how flower trends are changing with the seasons. 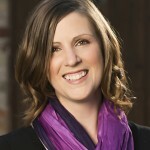 To find out, we sat down with Milwaukee florist Emily Neubauer, AIFD. 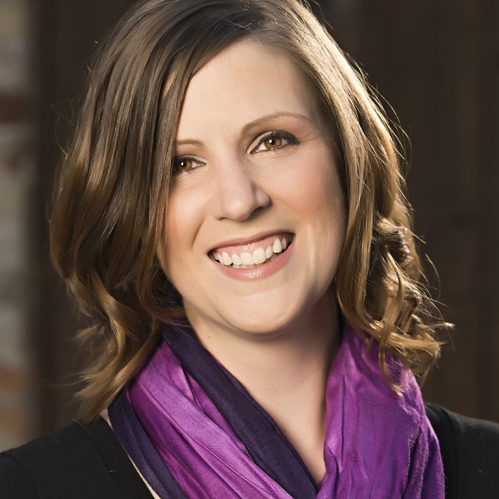 Over the nine years she’s owned Belle Fiori, 931 E. Ogden Ave., Neubauer and her team’s timeless, romantic design style have garnered accolades throughout Milwaukee and beyond. Here, she shares of-the-moment floral inspiration for couples marrying in fall. 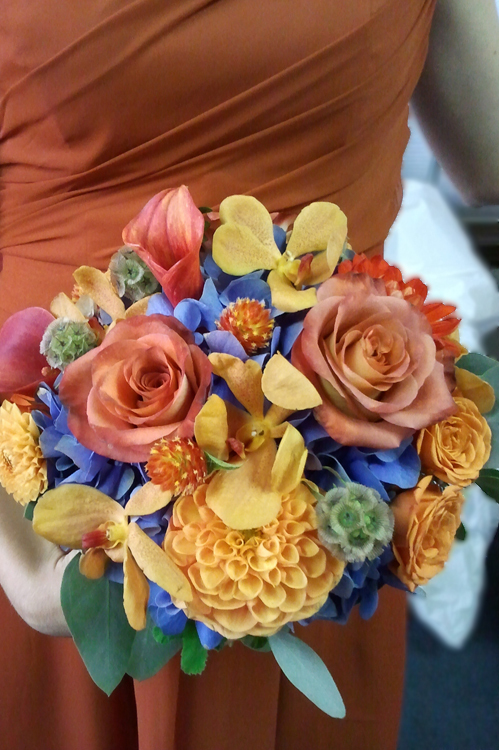 As fall approaches, what are some things that you, as a florist, look forward to? EN: We have a big change in available product, so it’s fun to see the textures coming in—fall is full of them: Berries, grasses, foliage or leaves that change color that we use in a different way, because they’re no longer just a green leaf. What unique flowers and foliage are making an appearance this season? EN: What we like about this season is that our local flower farm shines. This is totally their time of year, so we’ve got all the grasses, which are millet, rye, oats…and we get lots of texture from that. Sometimes they bring things we’ve never even seen before. What fall floral look is your favorite lately, and what color palettes are emerging as summer moves into fall? EN: I like the less expected color palettes. Everyone thinks of orange, gold and burgundy as fall, but there are some really pretty browns and taupes. The yellow palette is based on the sepia tone; not crisp white, but a tea-stained white or a Champagne. It’s paired with a buttery yellow with accents of dark goldenrod or deep mustard. Because it’s all muted, it’s more of an autumn tone, as opposed to summer’s vivid yellow. The other one that we’ve seen that’s really fun is a dusty pink with espresso brown, and also a pink that has a lot of gray undertones to it, which makes it almost a cosmetic color. Everyone’s calling it something different—one dress company calls it Spice and another calls it Antique Pearl. There’s no real name yet. How are your clients showing off their fall style? EN: We’re still heavy into vintage, so that’s using things that are a little darker—a lot of antique things have a taupe or sepia tone, which comes across well in fall. What wedding and event décor ideas have you been inspired by and are dying to try? EN: This year, barn wood is a big trend, and we’ve used it once. A very creative father of the bride made barn-wood boxes that we filled with flowers and put on long, family-style dinner tables. That was our most recent Pinterest inspiration. Tell me about some of your favorite flower combinations for autumn. EN: I always like balance, so we do a smooth flower, like a calla lily; a ruffled flower, like stock or hydrangea; and then something that spirals, like a classic rose or lisianthus. I fall back on balance which works in every season! If a couple isn’t into the rustic or country-chic look, how can they nod to the season? EN: The fall color palette could be balanced in a historic, formal setting like the Pfister. We can use burgundies and golds in a very elegant style. It’s probably going to have less of the branches and grasses, but the color will look like autumn. The tricky balance is keeping “rustic” from looking weedy, which is something we work on at all times of the year. When it comes to vases and other vessels, what’s popular with Milwaukee couples this fall? EN: The summer of 2012 was the summer of Mason jars, wine bottles and cleaned-out tin cans with twine wrapped around them. I think that will carry over into fall, but by next spring, we’ll have some new inspiration, but I don’t know what that is yet. We’re patiently waiting! I think Mason jars are just about done. Are there any autumn looks couples may want to steer away from? EN: Dried material! Craft-store cellophane-wrapped eucalyptus makes me cringe. Those dried products often have a lot of dye in them; a risk I don’t think you should play with while wearing a white gown on your wedding day. Raindrops and humidity will make that dye come out very quickly. 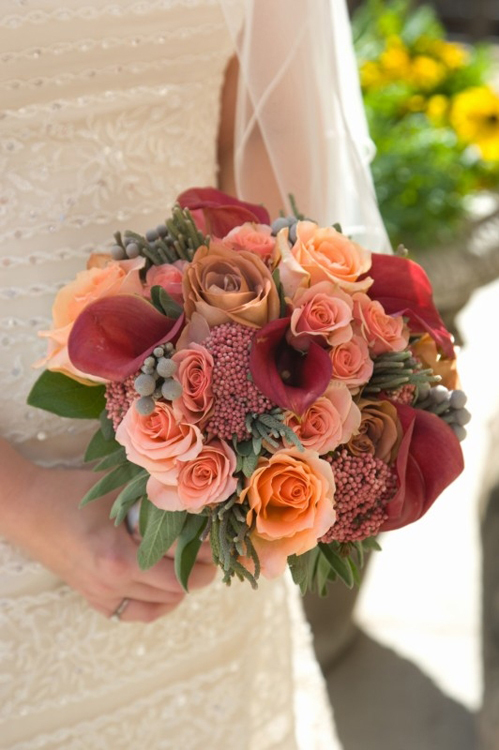 What are the bouquet trends this season, especially for wraps? EN: We’re topping the ribbon on the handle with a textured twine or jute that’s white or taupe. Still, lots of family heirlooms—I think that’s a nice trend that’s going to stay awhile: Grandma’s brooch, family rosaries or pearls. One bride whose dad had passed actually had his wedding ring tied to her bouquet. That was pretty sweet. How do you give a boutonniere the autumnal treatment? EN: That’s where some of the textural accents come back in. I’d pair a rose with berries and an autumn leaf instead of dark green foliage. It’s kind of like changing the accessories on the boutonniere. How are mothers of the bride and other VIPs being honored with flowers this season? EN: I really feel like wrist corsages are the most comfortable to wear, and they’re on the outside of the hug… However, we’ve had this little trend of moms—and I do believe it’s coming from the moms—that don’t want corsages, because women don’t wear them much anymore, and some feel like it’s something only elderly ladies do. While it seems like they’re helping the budget, I think they’re short-changing themselves. The couple should have this opportunity to honor their parents who have supported them all their lives, even if it’s with a simple, inexpensive wrist corsage. If the dancing begins and she wants to take the corsage off, it’s easy to do. What are some autumnal ways to dress up a ceremony space? 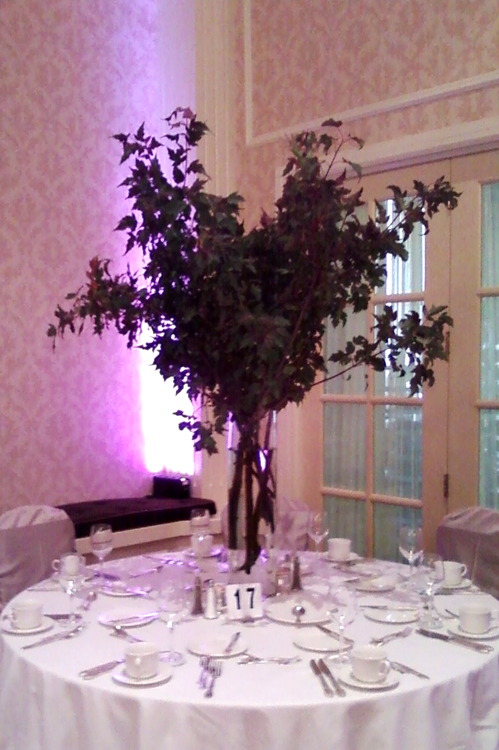 EN: Branches can be a great and inexpensive way to add height, so you get a lot of splash for the cash. But that again is a little tricky. Leaving birch branches brown and natural will have more of a rustic feel, or if you’re dressing up a space, you could paint them gold or copper. They’ll feel like autumn because they’re branches and the structure is natural, but they’re not quite as botanical or rustic as the plain ones. In terms of tablescapes, what’s hot now? EN: We’re seeing a lot of produce elements. Mixing flowers with produce, such as mini pumpkins, squash, gourds, apples and pears, is always appropriate. And the huge Pinterest trend is log slices being used as the base. It’s out there, it’s on Pinterest, it’s going to happen! What are ways to give a cake table fall flair? EN: Flowers should be an accessory to the cake design, so pick the frosting pattern first, and then if you want to dress it up with a little splash of color, we’ll figure out flowers that will match. Sometimes we work with the baker, who will make sweet little ganache acorns or beautiful white chocolate leaves painted with food coloring. Then we can accessorize with a fresh topper or leaves scattered on the table to echo the chocolate leaves on the cake. What seasonal blooms should budget-minded couples consider? EN: Mums are really great budget-wise. They come in a hundred colors and shapes and styles. There are big ones and little ones; some have long, fringy petals, and others are compact—there’s a nice variety. A mum looks very similar to a dahlia for a third of the price, and has 200 times the stability and longevity. They’re a hidden surprise. All flower arrangements for this article were designed by Belle Fiori.